I’m immersed in final edits on my book and enjoying the pleasures of summer. I’m valuing the simple things – watching a favorite movie on television, playing fetch with Poupon, (our cat who thinks he’s a dog), sleeping with the windows open so I can hear the owls hooting at night, and taking photos and videos of the animals that come to visit. If you missed the video I posted on Facebook last week of a doe and her new fawn, you can watch it here. It was awesome! I’ve been tracking the little things that bring me joy for over three years now and it’s still a surprise at what makes the list. Simple things. Tiny things. Things that cost nothing at all. Watching the sunrise or sunset. Finding a raccoon or rabbit in the yard. The squeak, squeak, squeak of a hummingbird. Pesto made from basil grown in our garden. Holding hands with Michael while out walking. Hearing baby birds under the deck tweeting for food. I don’t know about you, but the older I get, the more I appreciate the simple abundance right under my nose. If you haven’t done it, I highly recommend keeping a pleasure journal – it’s a terrific way to train yourself to see the world with new, grateful eyes. 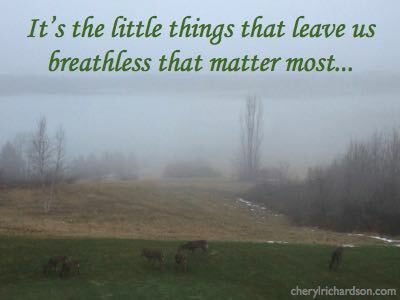 Because, in the end, the little things that leave us breathless end up being the big things after all. This week’s video provides a simple pleasure – a good laugh! You can watch it here (note: Left Brain is her husband). Thanks, Kelly!